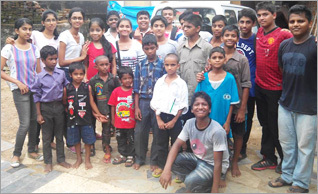 Daya Vihar Orphanange is created by the voice of these children who urgently needed our help. Dedicated to changing the way these children live, eat, and think they opened their home for these kids. Changes come by empowering them physically, emotionally, and socially - with good food, health-care, education, and vocational training. We invite you to be a part of Daya Vihar Orphanage and to view photos of the children we are helping. Each beautiful little face tells a story and each rupee they get - will go a long way towards giving these precious children opportunities they would otherwise never have. Unicef estimated in 1994 - the latest year for which figures are available - that India has 11 million homeless children, with a significant percentage living in urban areas. Orphans in India are among the most desperate of the poor. Day in and day out they live with hunger, severe malnutrition, and diseases. They have no homes, no families, no education, no healthcare and often no hope for future. They are without roof and root !! Still they live today. However, there is hope for these children. A special family willing to give up their comfortable lives and reach out to these children and give them a better life. 1. Basic Education : Asha is a school teacher by profession. Most of the children have enrolled in an English Medium School where they get basic education. 2. Clothing : There were times when the children had no cloths to wear, but now they have good clothes to cover themselves with. 3. Spiritual Instruction : Most of the children have never been to school and were not able to read and write. However, they are very intelligent and have the ability to grasp anything there are taught. To be able to make them responsible citizens of tomorrow, with a sound knowledge of values, right and wrong, their duties, how to live life, they are taught stories which bring out good moral lessons. 4. Health care : These children had no access to healthcare. Some of them suffered from TB, side effects of malnutrition and poisonous food. Many of them had worms in their stomach because they used to eat unhealthy food from wherever they get. However, they now have Asha and John to take good care of them. If funds are available, these children can have better care. 5. Shelter : Until the year 2002, the couple could only offer their home as a shelter till evening, for these destitute children. In the year 2003, a positive change had come about with the registration of a charity called "Compassion Charitable Trust" and the initiative of the orphanange "Daya Vihar". The children now have a secured and wonderful home to live in. 6. Surrogate Parenting : John and Asha have chosen to become surrogate parents to these precious and wonderful children. These children look to the couple for guidance and support. They are taught practical things such as hygiene, good manners and other important aspects that they would not have otherwise learnt. These children think of the couple as their parents, because nobody else has ever shown them so much love. Their Biological parents died or abandoned them, some of them at such an young age that as long as they can remember, They have been wandering in the streets of the city.